"When I was here before it was always a sad experience. But now I felt as though I'd been freed in a number of ways." 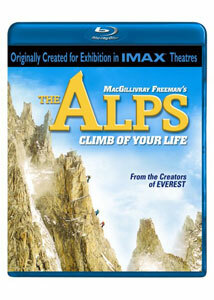 The Alps: Climb of Your Life takes a surprisingly personal approach to the material. At first glance it appears to be another pretty string of pictures spread across an eye-opening IMAX presentation. That's certainly the shell of the film, but not the core. The center here is a story of personal redemption of a climber intent on scaling the deadly Eiger, a peak jutting 13,000 feet up into the thin Switzerland skyline. John Harlin's stake in all of this is to reach the top of the peak that claimed his father's life forty years earlier, and he's determined to get there. A good deal of the beginning deals with Harlin's preparation. This is interspliced with particularly daunting footage of the Alps and some truly educational tidbits strewn about as well. It helps to invest the viewer in Harlin's story while laying down a satisfying background and understanding of the mountain range. It's pretty cool that this film is able to simultaneously engage you on a personal level and educate you - all while offering some jaw-dropping footage of the Alps. It feels a lot longer than its brisk running time, and that's only because it accomplishes a lot in 45 minutes. Once we get underway and see our climbers begin to ascend the epic sheet of ice, the footage is staggering and the IMAX cameras put you right there alongside them. If I have any qualm with the narrative structure it's that it occasionally gets sidetracked into some fairly dry educational bits. It especially lags when we go off on a tangent about the density of the land. It works to make a point, but it's not terribly engaging. Thankfully, it's a limited piece of the film. The narrative is enhanced with some classic Queen songs (and a haunting new score by Brian May). It's hard to not feel something when the intimidating shots of the Eiger's Northern face are juxtaposed with Who Wants to Live Forever. Awesome. Nature enthusiasts are certainly encouraged to seek this one out. Beyond that, the personal story works to engage as well. I found myself caught up in John Harlin's mission and rooted for him every step of the way. A very personal story about the triumph of the human spirit, it's got a lot more emotional weight than you might expect for a film such as this. I can only say it makes things all the better. Image Transfer Review: The crisp and detailed surfaces of the Eiger's peak is available in daunting detail. This AVS encode is a sharp transfer with good colors and excellent saturation. I'm thrilled to say that artifacting seems to be a rare occurance in these days of high definition as I saw nothing of the sort here. Film grain is apparent but looks natural and is largely subdued. Audio Transfer Review: The 5.1 DTS track is a revelation here ... Queen's music sounds glorious in lossless audio and finds a perfect balance with the dialogue. Musical cues sound great rear and front speakers while the center track is used only for dialogue. There isn't much to say about this that isn't positive. It packs a whallop. Extras Review: The 39 minute making of is a compelling supplement to the feature film. It showcases the extensive pre-production footage and focuses on the challenges of shooting Harlin's epic scale. Well worth watching if you enjoyed the film. There are three featurettes, two of which showcase Switzerland during the summer and winter seasons. The last one is a promotional piece for MacGillivray-Freeman Films, the crew that shot this film. Additionally, you get 10 trailers (in HD) for their previous works. A trivia track rounds out the set. A gripping movie arrives with an enthralling high definition presentation on Blu-ray. If this sort of thing is your cup of tea, by all means, this is well worth your time.